Waterford, Ireland – Hosting Ireland, one of Ireland’s leading domain name registrars and cloud hosting companies today announced the launch of its Cloud based Website Builder. The new website builder provides the platform for creating stunning cool websites, and is ideal for people and businesses looking to get online. The cloud enabled website builder is quick and easy to use, but delivers the look and feel of a professionally built website. The Cloud Website Builder has been developed to meet the needs of anyone trying to get a high impact online presence, whether a simple stunning brochure site or a fully blown e-commerce website. The website builder comes in three packages, Starter, Premium and E-Commerce. Pricing is from as little as €99 per year and includes cloud hosting, a domain name of the customer’s choice, including a .ie domain, email and unlimited pages. Upgrading is quick and easy, so you can develop your website as your business grows. To mark the launch of Hosting Ireland website builder, Hosting Ireland is offering the Premium package for the same price as the Starter Package at just €99.00, reduced from €169.00. The Premium website builder includes over 100 premium templates, 3000 professional images, social media integration, CSS editing, advanced analytics, mobile pages, basic e-commerce and 25 email addresses. 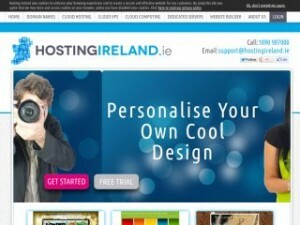 Hosting Ireland also offers a FREE trial, giving everyone the opportunity to try before they buy. Simply build your website first with the free trial and we’ll upload your design should you choice to purchase and publish.